COVINGTON, Ky. -- Most railroad underpasses in Covington, like in many cities, are often dark, dingy and somewhat scary places to take a walk. They don’t feel safe. 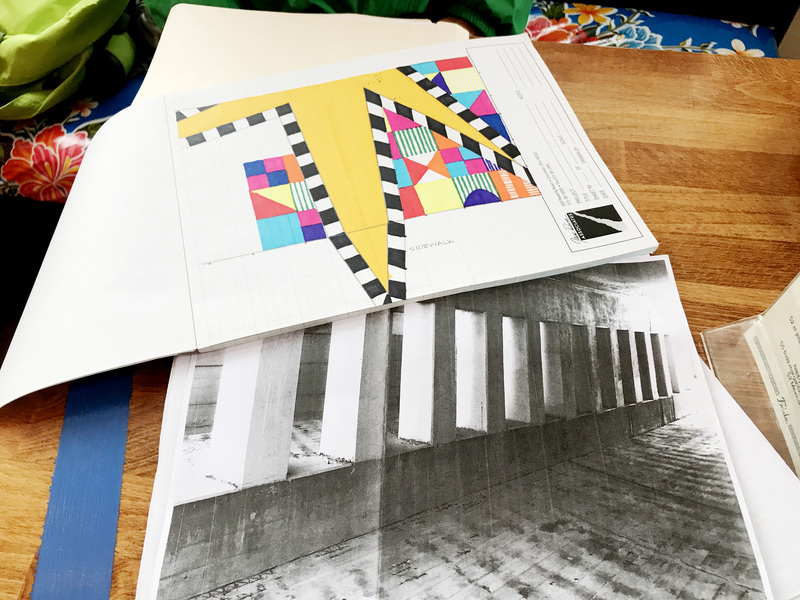 Walkers may change their minds by this fall when Emily Wolff completes her graphic design for the Sixth Street underpass that connects MainStrasse Village to Madison Avenue in Covington. Bright graphics will surround pedestrians with yellow, purple and red on the sidewalk, wall and ceiling. There will be black and white stripes on pillars between the sidewalk and roadway. Chandeliers will provide lighting. Yes, chandeliers. Work on the project got underway May 20, the weekend of Covington’s Maifest. Wolff painted 14 hours Saturday and 12 more Sunday. Wolff and her husband, Paul Weckman, are among the movers and shakers of Covington, winning this year’s Covington Award for their commitment to the community from the Friends of Covington. Wolff said they like Covington, where they’ve lived for 14 years, because of the creative thinkers who contribute to the city. The couple lives in MainStrasse, restores and sells homes in MainStrasse and are owners and chef at Otto’s and Frida’s . This, however, is Wolff’s project as an artist. Wolff said she was inspired after seeing and hearing of people taking Uber to Madison Avenue after they had eaten or shopped in MainStrasse Village – though it’s just two blocks away. (Madison is home to such businesses as Hotel Covington , the Hannaford and Inspirado . Braxton Brewing is just another corner away on West Seventh Street.) Besides a lack of signage, many pedestrians felt the route was uninviting and a little intimidating. Her community involvement led to the idea, but her art brought the project to life for People’s Liberty, a project of the Haile Foundation of Cincinnati that connects people with good ideas to money without going through a nonprofit organization. Wolff was awarded a $10,000 grant to do the project. People’s Liberty was a challenge for the Haile Foundation, he said. Most grants go to nonprofit organizations, and Haile asked the Internal Revenue Service for an exemption that would allow grants to go directly to individuals. They’re in the middle of the third year for the five-year grant project and have given out 55 grants – $10,000 for community projects, $15,000 for storefront projects and $100,000 for two annual fellowships. 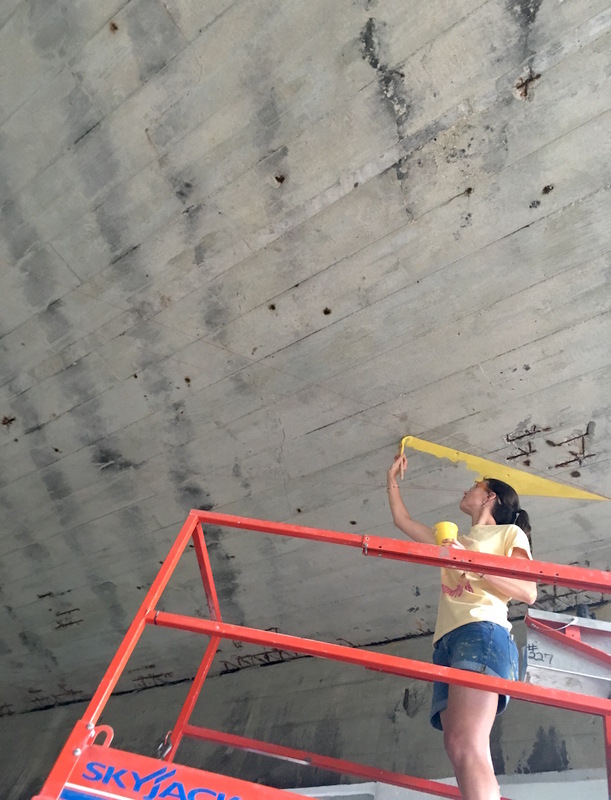 Renaissance Covington has applied for a $250,000 grant that, if approved, will fund five more rehabs to underpasses that split downtown Covington, Wolff said. Wolff is familiar with community projects. She helped drive the efforts to upgrade Goebel Park (and, yes, there are chandeliers – bright orange – there, too). It may just be her signature touch, although whether this lighting will be a bright color or not is still unknown. The next phase, lighting – both wiring and fixtures – is the most expensive part of the project, and most of the money will go toward paying for it. The underpass plan also includes wayfinding, the term now in vogue for directional signs, to point the way to MainStrasse or Madison Avenue. The walls will also have spaces where businesses and residents can represent themselves graphically, using circles, triangles and lines to tie into the design. Wolff calls it community storytelling. She plans to have applications for that part of the process available in the next few weeks. Will it all hold up to train rumblings and vibrations? Wolff offers an “I don’t know” look. “I hope so,” she said.